WCRE is proud to have exclusively represented The MandMarblestoneGroup, LLC. in the leasing of 5,325 square feet of office space for their suburban satellite office at 1 Raymond Drive, Havertown, PA. The MandMarblestoneGroup, LLC, is a tax law consulting firm that designs, administers and consults on qualified retirement plans. For over 30 years the MandMarblestone Group has worked with business owners, accountants and investment advisors who want to maximize plan contributions for owners, family members and select employees. 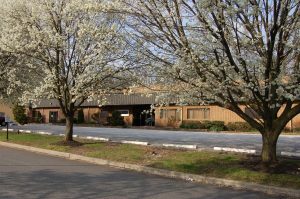 1 Raymond Drive is owned and operated by One Raymond Drive, L.P. and is a well located office building situated in the Delaware County submarket.This premier office location is positioned in the heart of Delaware County and provides for convenient access to I-476, PA – Route 3 and U.S.-Route 1. Andrew Maristch III, Vice President Corporate Services and Portfolios, Brian Propp, Director of Strategic Relationships and Joe Nassib, Associate, all of WCRE exclusively represented the tenant in this transaction.